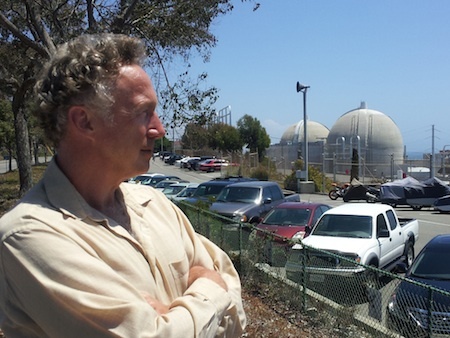 Anti-nuclear-power advocate Gary Headrick, outside the San Onofre plant, praised Laguna for opposing fuel storage at the plant. Residents thronged City Council chambers Tuesday to show their support for a strong resolution in opposition to the indefinite storage of spent nuclear fuel at the now closed San Onofre Nuclear Generating Station near San Clemente. The resolution proposed by Mayor Bob Whalen and new Council member Rob Zur Schmiede calls for federal authorities to expedite the creation of a permanent site for nuclear waste and an interim one less vulnerable to earthquakes, tsunamis and possibly terrorism. “Your resolution is perfect,” said Gary Headrick co-founder of San Clemente Green, who led successful efforts to shut the plant. It will serve as an example for others to follow, he said. Despite Headrick’s praise, the measure approved unanimously serves only as a clarion call for public pressure since the plant and the utilities that own it are regulated by state and federal authorities. Southern California Edison’s decommissioning plans calls for moving 1,609 metric tons of nuclear waste from steel-lined concrete pools into concrete-encased steel canisters, known as dry cask storage, which is generally considered safer than other solutions. Earlier this month, SCE selected Holtec International to design the underground dry storage system similar to the one they built for the decommissioned Humboldt Bay reactor near Eureka. However, activists, including Let Laguna Vote, argue that SCE may not be choosing the best and safest storage system. Further, they disagree with the Nuclear Regulatory Commission’s position allowing SCE to use decommissioning trust funds for purposes other than the safe storage and removal of the fuel. In a surprise twist for a crowd that anticipated opposition from the utility, SCE vice president Tom Palmisano said, “fundamentally, personally, professionally and as a company, we are in agreement with many of the sentiments expressed in the resolution.” He also criticized federal regulators for failing to devise a long-term storage facility for radioactive waste. Council member Steve Dicterow pushed on, asking Palmisano if the utility agreed with the resolution’s language that SCE must shoulder responsibility for the safety and security of the spent fuel rods and for making changes as storage technology improves. “We agree. We are responsible” for the safety of the spent fuel, said Palmisano. “And as technology improves we will continue to pay attention to what the improved inspection and abatements technology is,” he said, addressing the second point and referring to current technology, which offers little in the way of monitoring the integrity of the casks once they are sealed. Palmisano’s assurances did not entirely persuade Rita Conn, chair of the civic activist group Let Laguna Vote, which has been shining a light on safety concerns surrounding San Onofre’s nuclear waste. “I can’t help but wonder why Edison is so quick to agree with our resolution” when representatives spent much effort lobbying San Clemente council members to back down from theirs, Conn pointed out. “Our resolution must go to Washington,” Conn said. “It will enable us to take it to other cities, to continue the march. It is our only beacon of hope.” The battle, as she sees it, is over pressuring regulators into forcing the utility to shift its emphasis from spending funds on site clean up before budgeting for the transport of spent fuel to a temporary or permanent off-site location. “It’s the storage that’s the issue,” said Deborah Laughton. She pointed out that Finland has prepared for nuclear waste storage by committing to digging and lining the rock walls of a 30-mile ditch with concrete and steel to store their nuclear waste. Our federal government needs to start working on a similar project, she said. Headrick said the nuclear industry and its regulators were unprepared for the current environment. “We are suddenly closing nuclear power plants at a rate that’s just going to increase and we don’t have good answers. “We’ve seen that it takes public participation to push this forward and to get real answers to hard questions that have been kicked down the road as far as we can afford to,” he said, adding that NRC has not yet approved what critics believe to be the best dry-cask storage contractor. A unanimous vote approving the resolution, which included language that SCE be held responsible for plant safety and “any damage resulting from storage,” set off an extended round of applause and whoops. Copies will be forwarded to state and federal regulators, the utility, the governor, Senators Barbara Boxer and Diane Feinstein, and Rep. Dana Rohrabacher. “We would hope you assist us as a public agency in getting that message to the right people,” Whalen suggested to Palmisano.